One of my favorite passtimes is to go hunting for vintage cookware, whether it be at an estate sale, garage sale, antique shop, thrift store, or flea market. On one such adventure, I found a vintage, orange-enameled fondue pot. Making fondue had never really crossed my mind, but finding this wonderfully retro object inspired me to give it a go. Of course, it took me a little while longer to procure a matching set of vintage fondue forks, but once they were found, the cheesiness was well underway! I invited several friends over and made a night out of it, seeing as how the tradition of fondue is also a social one. Apologies for not having a proper image of the actual cheese; it cannot be made ahead and is best served immediately once done (it would have been ungracious behavior as a host to have guests wait while I took photographs, hah!). 1. Dice the cheeses into 3/4-inch cubes. Set aside. 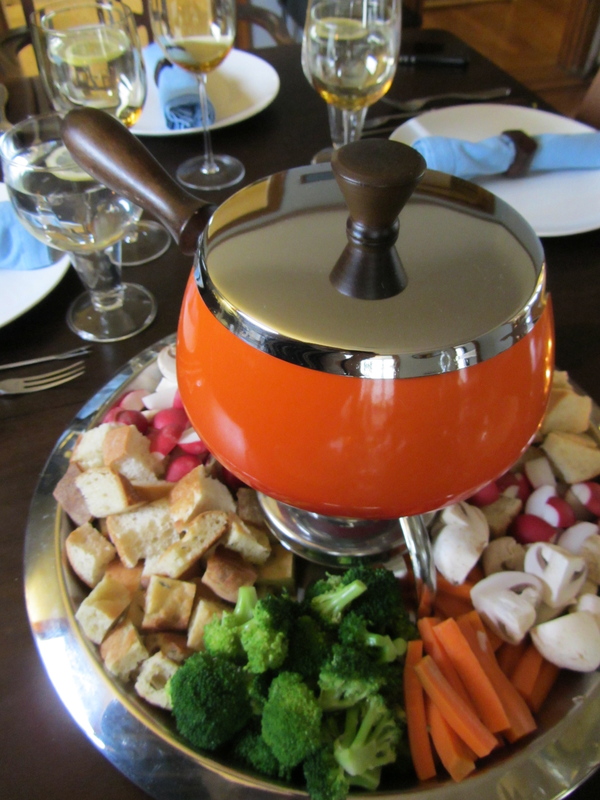 Assemble fondue pot, turn on its heat source, and allow to preheat while making the cheese fondue. 2. In a small saucepan set over low heat, warm the wine until it just begins to bubble. Remove from heat, set aside. 3. In a medium saucepan set over medium-low heat, make a roux by melting the butter, then stirring in the flour to make a thick paste. Continue to stir for a few minutes to cook away the raw flour taste. 4. While constantly whisking to prevent lumps, gradually pour the warmed wine into the roux. Whisk until smooth. 5. Using a wooden spoon, and stirring in a figure-eight pattern, stir in the diced cheese (work in 2 or 3 batches if needed) until smoothly melted and fully incorporated. Season to taste with freshly grated nutmeg. 6. Transfer mixture to the preheated fondue pot. Serve immediately with diced loaf bread and other assorted cut vegetables. * Be sure to dice, not shred the cheese. It may seem logical to shred the cheese for melting, but no: shredded cheese will melt too quickly, and the oils can cause the fondue to separate. * Acidity is needed to hold the fondue together. For a non-alcoholic version, substitute 1 cup milk and 2 tablespoons cider vinegar for the wine. * For those who are wondering, this recipe is a simplified amalgamation of various cheese fondue recipes researched off the internet and out of books. That is a really lovely vintage fondue, what a great find! I love fondue too, and thank you so much for the tip about dicing the cheese. I’ve done it the other way and it has separated out to not so nice cheese oils a couple of times. Dicing from now on!